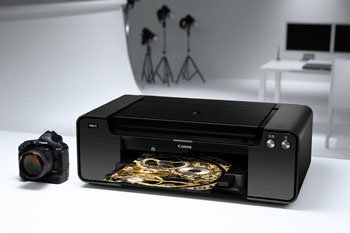 Canon has launched of its new flagship Pixma Pro printer for gallery-quality prints of photos and artwork. 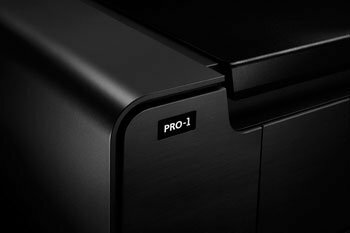 The company says that the Pixma Pro-1 is the world’s first A3+ printer to feature 12 separate inks. The Canon Pixma Pro-1 features a design inspired by the company's EOS digital SLR cameras. 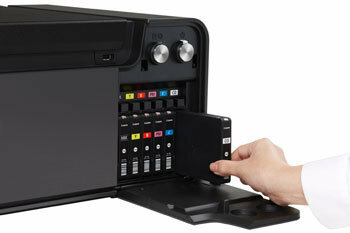 The 12-ink system significantly expands the printer's colour gamut over previous Pixma Pro models. There are two black inks (Photo and Matte), three grays (Dark Grey, Grey and Light Grey), six colours (Cyan, Photo Cyan, Magenta, Photo Magenta, Yellow and Red) and a Chroma Optmizer, which Canon says "increases black density and makes glossiness uniform". The five monochrome inks are designed to produce professional-quality black and white prints with detail in shadow and highlight areas, as well as smooth tonal gradation and suppressed graininess. The Pixma Pro-1 supports an input resolution of 1,200dpi (double that of previous generations of Pixma Pros). Canon says that this reflects the increasing number of pixels available on professional cameras and allows the Pixma Pro-1 to produce smoother prints with high resolutions of up to 4,800x2,400dpi. The new Optimum Image Generating (OIG) system analyses the photo colour and calculates the optimum ink combination and volume of ink droplets, which are then accurately placed on the paper by Canon’s FINE print head with 12,288 nozzles. Canon says that the OIG system enhances colour reproduction, natural tonal gradations and uniform glossiness in each print mode and media type. Smooth tonal gradations in colour and monochrome prints are achieved through 16-bits per channel printing capability. The Pixma Pro-1's ink tanks have been made larger that those in older Pixma models to ensures longer running periods can be maintained between ink changes. Front-opening panels enable easy access to the tanks either side of the main printer body, and for efficiency the rear tray takes up to 20 sheets of photo paper, while the manual feed slot accepts photo paper up to 356mm (14-inch) wide and heavier fine art papers. For saleable prints, Canon says that the printer's real-time droplet volume control stabilises colour and ink density to ensure colour output is consistent from print to print. 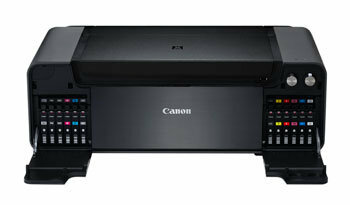 To boost, Canon has included features commonly found on wide format professional printers, including a mist fan with an air circulation system and a tubular ink supply system separate to the print head. 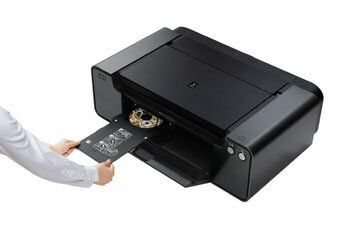 The Pixma Pro-1 ships with wthe Easy-PhotoPrint Pro software. This runs as a plug-in for Photoshop and Canon's Digital Photo Professional software, plus as a standalone tool. The printer can also automatically select the correct ICC profile for each Canon paper, and an expanded range of ICC profiles is available for Fine Art papers from other manufacturers. The Colour Management Tool Pro software, which can be downloaded from software.canon-europe.com supports X-rite colour management tools, including Colour Munki Photo and Colour Munki Design, and enables users to create custom ICC profiles to ensure the optimum output quality. The Pixma Pro-1 also includes the Ambient Light Correction feature so that users can select the type of lighting under which a print will be displayed. The print colours are then automatically adjusted to ensure the very best colour reproduction under different viewing conditions. The Pixma Pro-1 has USB 2.0 and Ethernet ports, and will be available from November 2011, priced at £666 plus VAT.